The objective is to demonstrate a twin-row shelterbelt and an Eco-Buffer shelterbelt. Shelterbelt design at Brookdale Farm indicating location of species and length of rows. helterbelt design at Johnson Farm indicating location of species and length of rows. 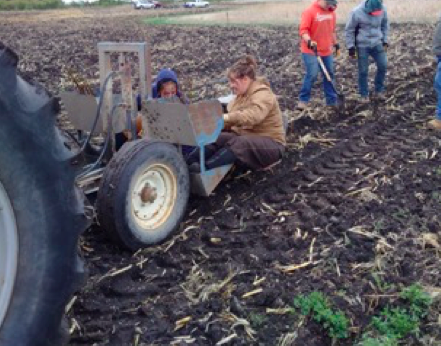 lanting twin-row shelterbelt at Brookdale Farm with MBFI and UARCD staff on May 11, 2016; photo by MB Ag. Twin-row shelterbelt at Brookdale Farm on July 5, 2016; photo by MB Ag. Twin-row shelterbelt at Brookdale Farm, west side of field, on August 24, 2016 showing the heavy weed growth around the trees and shrubs; photo by MB Ag. Twin-row shelterbelt at Brookdale Farm, middle row, on Sept. 1, 2016 after hand weeding; photo by MB Ag. 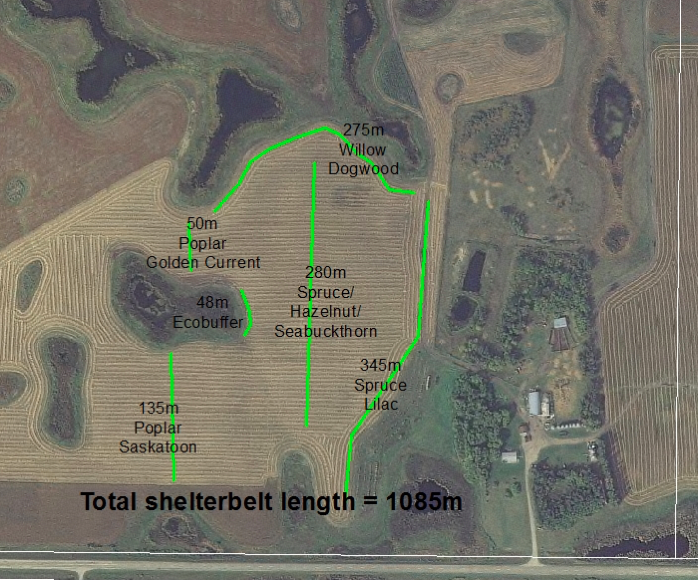 Shelterbelts provide many ecological benefits including reduced soil erosion, riparian area or shoreline protection, reduced odours from animal production sites, reduced pesticide drift, reduced greenhouse gas accumulation in the atmosphere (carbon sequestration), improved water quality through filtering function, floodplain management, and increased biodiversity or wildlife habitat. Each of these benefits society as a whole as well as landowners. 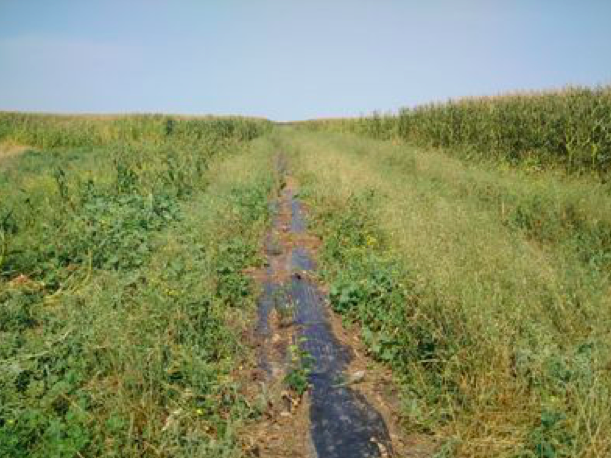 Shelterbelts also provide many benefits in livestock pastures and calving areas. Reduced wind speed in winter lowers cold stress on cattle which may improve animal health and increase feeding efficiency1. 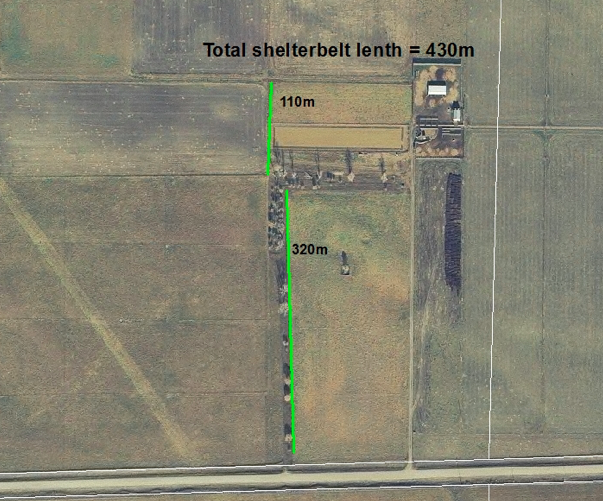 Shelterbelts also protect the working environment in and around the livestock area as they also screen noise and odours associated with livestock operations. Eco-Buffers (ecological buffers), designed by researchers at Agriculture and Agri-Food Canada, are multiple rows of native trees and shrubs planted in a dense, mixed planting arrangement. The purpose of these plantings is to enhance biodiversity, conserve soil, protect water quality and sequester carbon. Eco-Buffers could be located anywhere a traditional shelterbelt would be planted or where a natural hedgerow may have existed. They can also be used to enhance existing natural hedgerows or to connect natural habitats such as a wetlands, riparian zones or wooded areas. In addition to their ecological function, Eco-Buffers could provide a source of wood and non-timber forest products (i.e. fruit, mushrooms)2.